"I created this when I had donuts starting to go stale and knew no one would eat them. But, they did devour this dessert. Use the fresh fruit of your choice." Whisk cold milk and vanilla pudding mix together in a large bowl until completely smooth, about 2 minutes. Let stand until pudding thickens slightly, about 5 minutes. Break up donuts into smaller pieces; spread half in the bottom of a trifle bowl. Layer half of the pudding, bananas, strawberries, blueberries, raspberries, and whipped topping over donuts. Repeat layers. 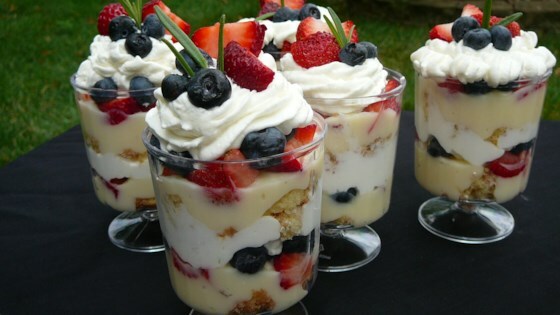 Garnish with whipped topping and a few pieces of fruit. Chill until serving.